One of my favorite Christmas movies probably isn’t even a Christmas movie, technically. Set in 1903, Meet Me in St. Louis chronicles the life of the Smith family over the course of a year. Father Alonzo Smith (Leon Ames) is a successful banker who provides for his large and happy family. Mother Anna (Mary Astor) runs the busy household with the help of their delightfully opinionated housekeeper and cook, Katie, played by pleasantly irascible Marjorie Main. Grandpa (portrayed by marvelous character actor Harry Davenport) lives with the family and warmly dispenses both wisdom and mischief to his granddaughters. Daughter Rose (Lucille Bremer) is pursuing the affections of Warren Sheffield (Robert Sully), while daughter Esther is falling for the new boy next door, John Truett (Tom Drake). Esther is played by Judy Garland in what is certainly one of the finest performances of her career, and it was on the set of this film that she met director Vincente Minnelli, whom she would later marry. Henry H. Daniels Jr. plays son Lon Jr., who is preparing to head off to college. Little sister Agnes is played with aplomb by young Joan Carroll, but the whole movie is all but stolen by Margaret O’Brien, who turned seven during filming. Her role as the youngest Smith daughter, Tootie, is her best remembered in a ten-year cinematic career, and one that garnered her a special Oscar Award. Hollywood had been producing movie musicals for years at this point (1944), but Minnelli gently and skillfully sculpted a whole new kind of musical where the songs were organic expressions of emotion germane to the scene, rather than some volcanic musical eruption that threatened to melt the audience’s suspension of disbelief with its sheer absurdity. New musicals followed suit, ushering in the golden age of Hollywood musicals. Meet Me In St. Louis manages to be completely engaging, notwithstanding a straightforward and uncomplicated storyline. Essentially, the Smith family home in St. Louis is filled with love and laughter, even as they struggle through the everyday, mundane challenges of life: son leaving for college, daughters falling in love, young children under foot, nurturing parents providing for their family’s needs. All of this is set against the backdrop of St. Louis preparing to host the World’s Fair in 1904, and the music is a perfect blend of actual popular music from the period and three now-classic tunes penned specifically for this movie. Namely, The Boy Next Door, The Trolley Song, and Have Yourself A Merry Little Christmas. One day, Father comes home and excitedly announces that he has a tremendous opportunity at work and the family will be moving to New York City. No one else in the family, however, shares Father’s enthusiasm, and their visible disappointment quickly turns a happy family moment into one of dread and distress. After some hurried reflection, however, Mother manages to bring the family together by playing the piano and encouraging Father to sing along. Their joyous duet lures the other members of the family back into the parlor, and their family unity is restored. Still, in the ensuing weeks and months, the reality of their impending move looms ever closer on the horizon, and each member of the family struggles in their own way to reconcile their feelings. This culminates on Christmas Eve in one of the most touching and powerful scenes in the film. When Esther walks into the younger girls’ bedroom long after they should have been asleep, Tootie is sitting in the windowsill, staring anxiously out into the moonlit night. She confesses to her older sister that she is concerned that Santa won’t know how to find them in New York because he’s always come to this house in St. Louis. As Esther consoles her, Tootie is lost in her own thoughts. 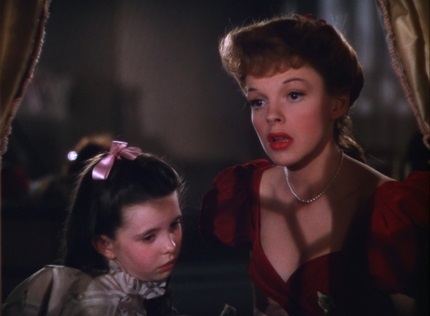 Then the now-familiar chords are heard (as if from a music box) and Judy Garland begins to sing Have Yourself a Merry Little Christmas. But the song is not the upbeat Christmas carol we have come to know in recent years, but rather a mournful, introspective dirge accentuated with perfect lunar lighting on Garland and O’Brien’s youthful faces. What follows is a tremendous and powerful release of emotion between the two on-screen sisters that perfectly frames this family’s devotion to each other. If you can somehow manage to sit through this scene without getting a lump in your throat or tears in your eyes, you may want to check and see if you have a soul. Meet Me in St. Louis runs 113 minutes, and maybe 13 of those minutes (near the end of the film) are wrapped up in Christmas. The rest of the film follows the family through the other seasons of the year, and yet the simple scene with Garland singing Have Yourself a Merry Little Christmas somehow makes the whole movie feel like Christmas. It reminds us that the Christmas spirit is the Spirit of Christ, a spirit of perfect love that permeates imperfect families as they struggle together through the uncertainties of mortality. It is also a reminder that while most movies involve some extraordinary challenge or catastrophe that our heroes have to overcome, sometimes the most difficult trials of real life are not matters of life and death, but merely living itself. As my wife and I have watched our own children grow up and move away into adulthood, the memories of our own childhoods mix with those of raising our kids and with fond remembrances of friends we’ve loved along the way. Until then we'll have to muddle through somehow.